RAILROAD.NET • View topic - Subway cars in Grand Central Terminal? Re: Subway cars in Grand Central Terminal? Would the Governor be there for the ribbon cutting? NorthWest wrote: They operated under their own power though they required 'change in position' to the third rail shoes. http://www.nytimes.com/1964/09/10/stainless-steel-cars-to-brighten-bmt.html?_r=0Note the anticipated '35-year operating life'. The R32s (and IRT R36s) were due for retirement by 1999, but the GOH program extended their lives. UpperHarlemLine4ever wrote: There was also a connection between the railroad network and the NYC subway at East 180th Street via the old NYW&B viaduct at this location. This viaduct is gone and apartment buildings now stand in its place. I attended Cardinal Hayes HS which was adjacent to the Mott Haven Yard and in 1962-63 the yard had R-33 (Redbirds) in them constantly on their way to the IRT via the Port Morris Branch and the NYW&B viaduct. The Unionport (East 180th Street) interchange between the IRT and NHRR was removed by 1979. The Main Line R33s (probably the cars you mention, bright red livery with yellow grab irons) were delivered from St. Louis between November 1962 and mid 1963. 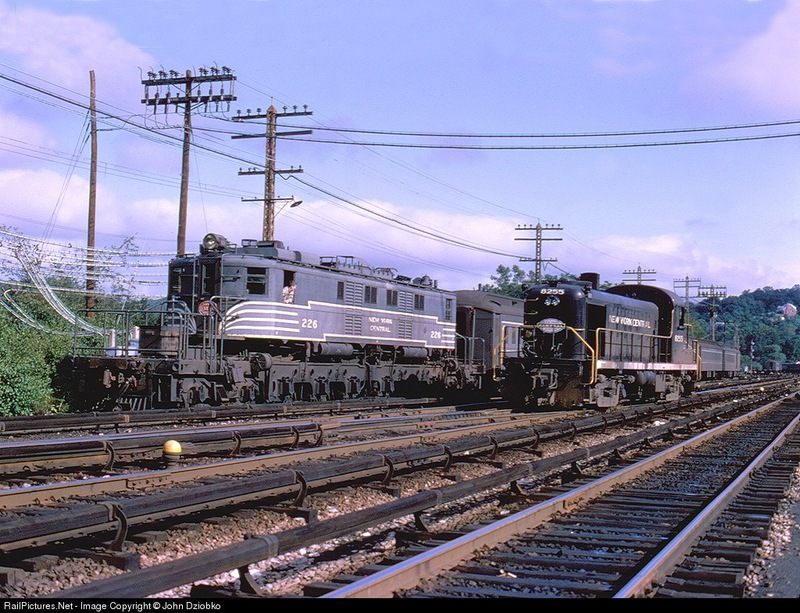 This implies they went NYC via Cleveland and Buffalo, although some R33/R36s did go on the PRR via Columbus and Pittsburgh to the carfloat at Bayonne. I don't know the routing these cars took to get to New York but I know what I saw. My high school was right next to the Mott Haven Yard and every week there was a new trainset of 10 cars, sometimes 2 trainsets in the yard. This went on for almost my entire junior year. I believe also that the TA had started scrapping the R-32, however, cracks found in the R-44 put that on hold and the entire R-44 fleet (minus the SIRT cars) were pulled from service instead. Interesting note (I know that this is a MNR page) but the R-32 cars were built by the Budd company. Budd had pioneered the stainless steel carbody construction, and had propsed (pestered) the TA to go stainless since the 1940's. Budd received only ONE full procurement contract for subway cars (the R-32), which was the first stainless carbody (excepting the 10 car experimental R-10, also Budd.) However, every fleet procurement since the R-32 has been stainless steel. My father was a motoman for the TA, even today, he says the R-32 was the best trainset the TA ever had. They were lightweight and would fly. The first car was Budd's BMT Zephyr in 1934 and the second was Budd's R11, ten car bulk order. Then they finally went into the deep section of the pool with the 600 car order of R32s. So I would say the R32s are the 3rd set of stainless cars. Last edited by GirlOnTheTrain on Tue Jun 27, 2017 8:28 am, edited 1 time in total.